I'm tapping this message out as we are mid flight on our way to San Diego. For the first couple hours our little did the best he could to entertain himself in our 3-seat row. His favorite activity, by far, was playing with the now deactivated Air Phone installed in the seat in front of him. The boy loves phones and buttons, and here within reach is just such a specimin to interact with. The fact that it has a button you can press to pop the phone out with a solid thump, and then a auto retracting cord, is just icing on the cake. 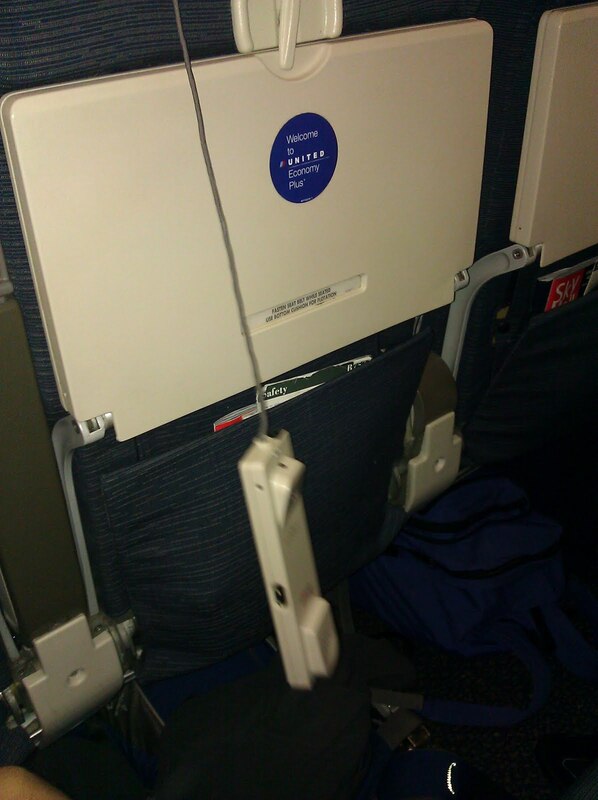 As technology flops go, the in seat Air Phone has to be up there in the record books. Good to know that all that technology and investment could be used to entertain a 14 month old. Currently, the boy is sprawled out on the seat between Shira and Myself. It's a precious sight to see, to say the least. If he sleeps the rest of the flight, that will be a quite the gift. What will happen when we land and Shira and I ready for sleep, and he's waking up rested - well, we'll just play that by ear. Exactly! Shira caught the error, but as soon as she told me what I had written, I knew that it was my subconscious talking and not a run of the mill typo.